In most cases, this system is used to cultivate small plants for the top buds. Seedlings can be induced to flower at 5 weeks while clones can be induced to flower at 6 inches tall. Plants are grown in a V shape. This allows for a greater yield than plants that are all at the same height. This system can be constructed cheaply with 2×4 wood and 4-inch PVC pipe. 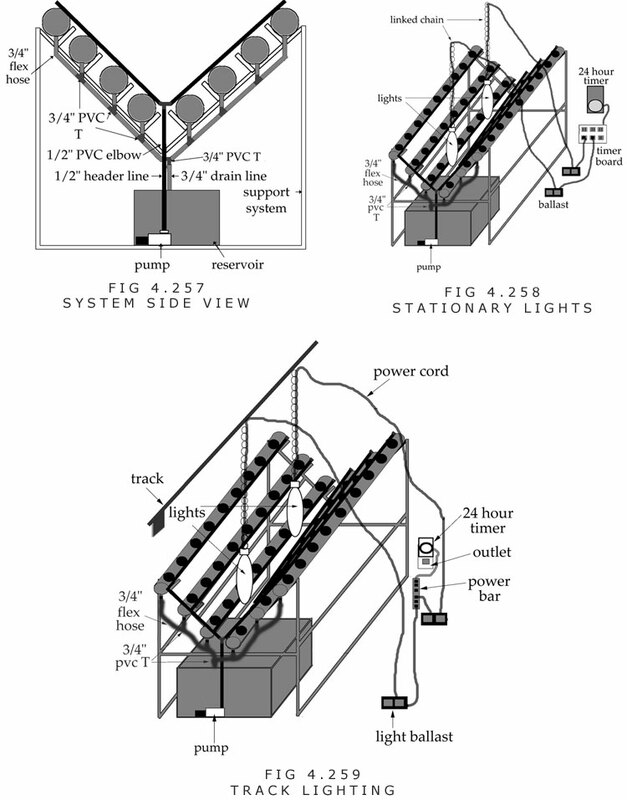 Like most aeroponic systems, this one is used by experienced growers who can easily troubleshoot the system. 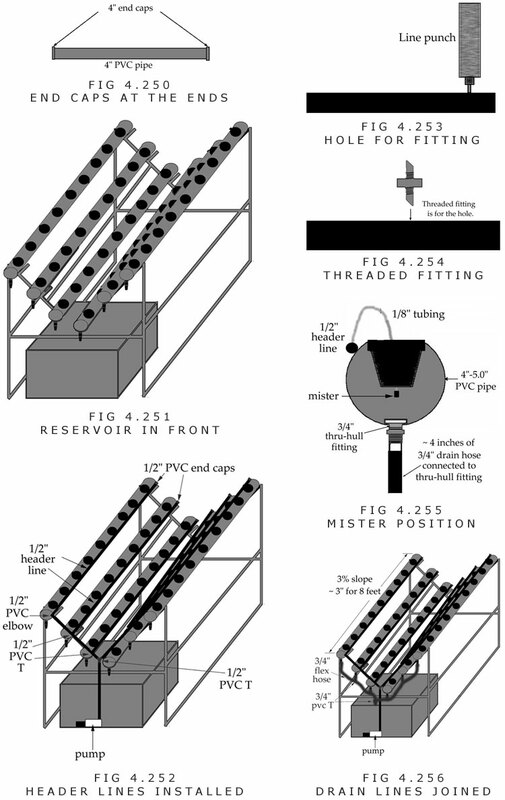 A novice grower may want to use the NFT V-system on page 121 or the top-feeding V-system on page 86. 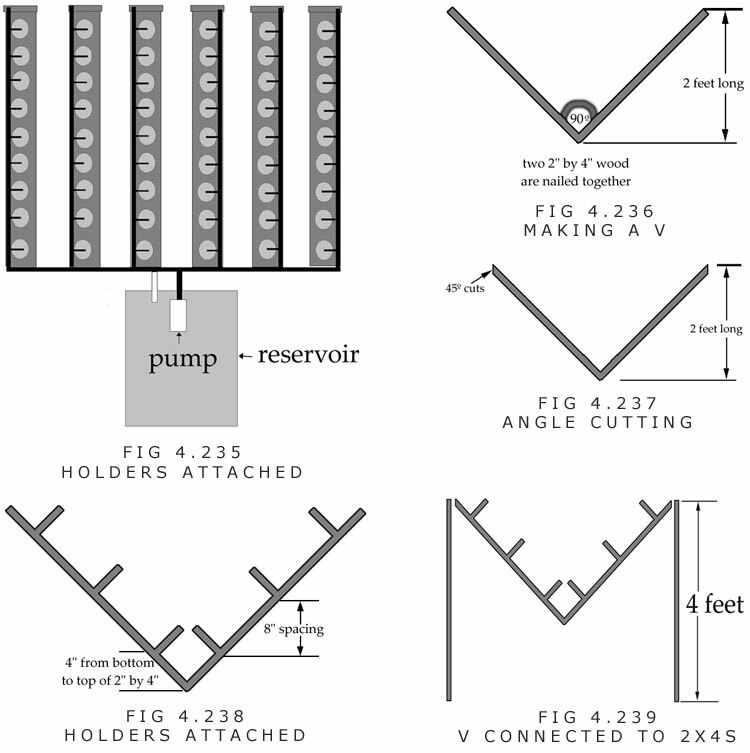 The material list below is described for a common 6-pipe system. 1. One small mesh per plant (i.e. 31/2 inches). 2. Ten 2x4s to support the 8 to 12-foot lengths of pipe. 4. One-foot piece of 1/8-inch tubing per plant. 6. Six 1/2-inch PVC end caps. 7. Four-inch PVC pipe cut to equal 9 to 10-foot lengths. 8. Twelve 4-inch PVC end caps. 9. 1,200-gallon per hour (or stronger) pump. 11. 1/2-inch black poly tubing for header lines (75 to 100-foot roll). 11. Two 1/2-inch PVC elbows. 12. Five 3/4-inch PVC Ts. 13. Six 1/2-inch PVC end caps. 15. Ten feet of 3/4-inch flex hose. 17. Clay or lavarock to fill each pot. 18. 3 to 31/2-inch nails. F. The two 7 to 8-foot pieces of 2×4 are nailed halfway up the lengths for additional support. I. Holes are cut into the pipes at 8 to 10-inch centers. This is 9 to 11 sites per 8-foot piece of pipe. J. Pipes are placed on stand. K. A 1-inch holesaw is used to cut holes on the bottom of each pipe for thru-hull fittings. The hole is made in the front. N. The reservoir is placed under the front. 1. A piece of 1/2-inch tubing is connected from the pump to a 1/2-inch PVC T.
2. Two pieces of 1/2-inch tubing are connected to the 1/2-inch PVC T. The tubing must reach the highest pipes on each side. 3. 1/2-inch PVC elbows are attached to the ends of the tubing. 4. 1/2-inch PVC Ts are inserted into the tubing next to the other big pipes. 5. 1/2-inch tubing (8 feet) is connected to each 1/2-inch PVC elbow and 1/2-inch PVC T.
6. 1/2-inch PVC end caps are inserted into the ends of all 1/2-inch tubing. 1. A hole is made in the 1/2-inch tubing next to each plant site using a hole punch. 2. A threaded fitting is inserted into each line. 1/8 to 3/16-inch fittings work fine. 3. One-foot of 1/8 to 3/16-inch tubing is cut for each plant site. 4. A hole should be drilled into each 3 to 31/2-inch mesh pot in the middle of the bottom. The hole should be one size smaller than the tubing size to make a tight fit. 5. The 1-foot line is drawn through the hole in the mesh pot. A mister is attached to the tubing. 6. The other end of the 1-foot piece of tubing is attached to the threaded fitting in the 1/2-inch tubing. 7. A pot can be placed securely in each hole. The mister should be an inch or so from the bottom of the pot. 1. The four lowest 3/4-inch thru-hull fittings are connected to 3/4-inch PVC Ts with 6-inch pieces of 3/4-inch flex hose. 2. The highest thru-hull fittings on each side are connected to the nearest 3/4-inch PVC Ts with the flex hose. 3. The lowest and second lowest thru-hull fittings are connected to one another with flex hose. 4. 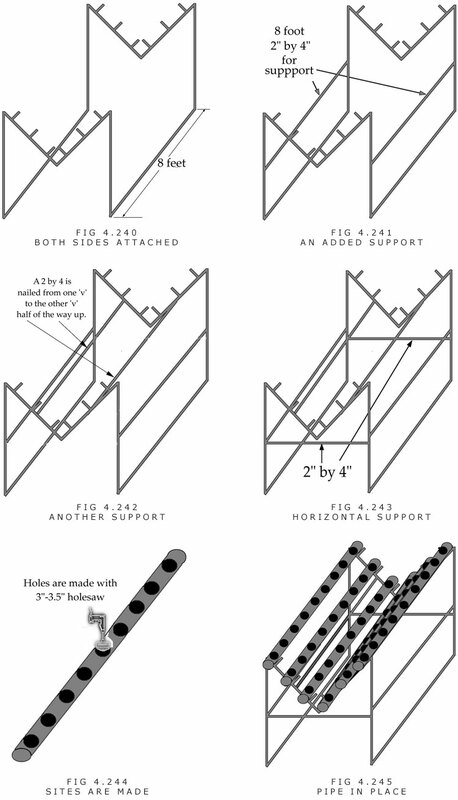 The lowest thru-hulls are connected together with a 3/4-inch PVC T.
5. 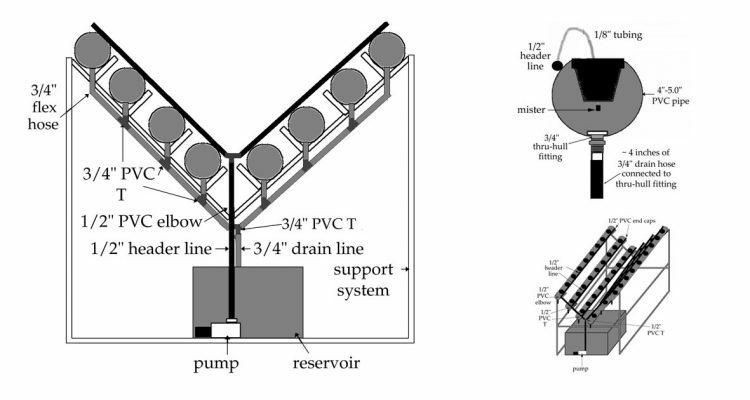 The loose end of the 3/4-inch PVC T is connected to flex hose that runs inside the reservoir. A 1,000-watt light and a 400-watt light, or two 600-watt lights could run on a regular household 15-amp circuit.